What do you do when everyone expects you to be amazing…and you’ve got nothing left to give? It’s an issue all busy women share—that pressure to always be a go-getter when sometimes all you want to do is get going (and stay gone for a long time). Whether you’re short on time, energy, motivation, hope, or all of the above, only one thing can bring your weary spirit back to life: Jesus. "My oldest will turn eleven this year. So basically, I've been tired for a decade. Stacey Thacker is the voice in my head telling me I'm going to be okay. This book is your permission slip to stop feeling like you have to be all things to all people all the time." "This book came to me at a vulnerable time in my life when I couldn't have felt less amazing. After reading Stacey's gentle yet powerful words, I knew a welcomed, hope-filled revival in my spirit. Without a doubt, Fresh Out of Amazing is the meeting place where your tired, worn-out heart finds God's gifts of tender mercy and renewed strength." "Stacey's words sweep me off my feet and put me on my knees in worship to the One we all long to know and love. With the voice of a tender mentor, the heart of a kindred-spirited friend, and the wisdom of a seasoned disciple of Christ, Stacey wins my heart. Her inviting words, rich biblical teaching, and a wealth of practical insight will guide you from the land of lies and lack to a wide and spacious place filled with hope, anchored in Truth." "Stacey is a born encourager. For years, I've watched God use her words of wisdom to bring clarity and courage to women, propelling us toward the everyday purposes and dreams God has for us. Through Fresh Out of Amazing, you'll be influenced to enjoy and worship God—even through the driest and darkest places of your life." "In Fresh Out of Amazing, Stacey lets us know that on those many days when we just have nothing left, we are not alone. But she doesn't leave us with just having a friend who understands. With the power of God's Word, she takes us by the hand and shows us how we can find in Christ exactly what we need to not just keep going, but to thrive." "Stacey is the friend you call when you are at the end of yourself and you need someone to speak equal parts truth and grace over you. Within these pages you will find a kind companion who knows the heartache life can bring. Stacey is a generous guide who uses Scripture and story to point us back to the God who captures our tears and draws us near." "No matter what season of life you find yourself in, there's always a need to feel like someone understands you. 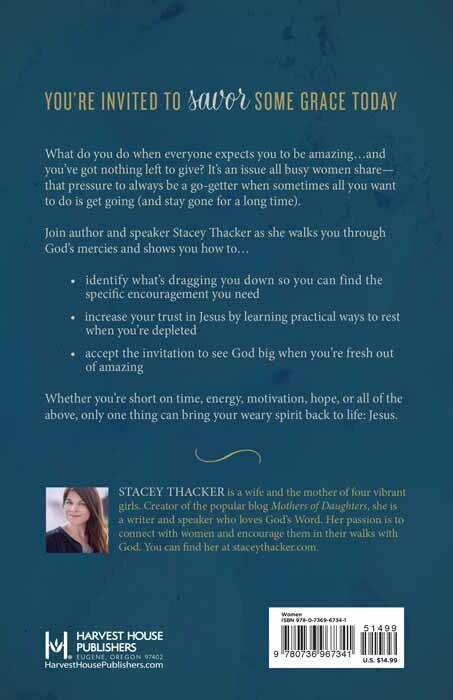 Stacey Thacker is that person, and in Fresh Out of Amazing, you will find that 'I've been there too' encouragement." 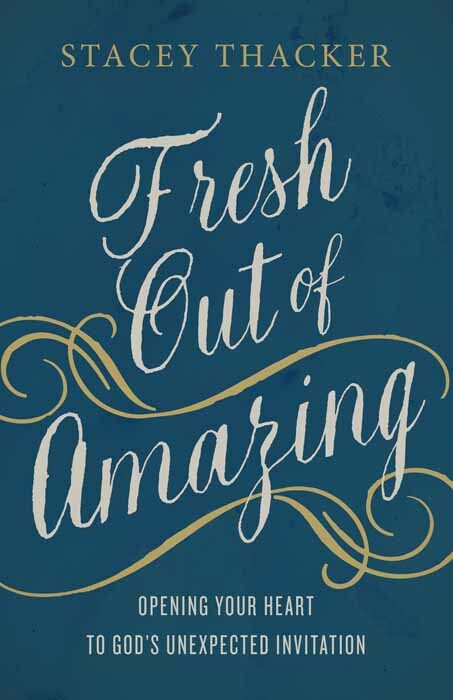 "Fresh Out of Amazingis a soul-filling, heart-reviving invitation to open your heart to God's life-changing work. These Scripture-soaked words present the power of God's grace and the gift of His hope in a way that's relevant for any woman on a journey of faith." "I could tell you Stacey Thacker is a great writer, because she is. I could tell you she's a great mother, because she is that too. Wife, friend, and singer extraordinaire, that's her. But the best thing about Stacey is her ability to share the deep, sometimes hard, truths in a way that leaves you loving Jesus more than when you started. In a world that says we have to be amazing to measure up, Stacey points to grace." "This book feels like the truest kind of friendship shared over a cup of coffee with your shoes kicked off. Stacey is authentic, insightful, and devoted to helping women discover how to return to the One who is always amazing when we're fresh out." "In the midst of my own world of burdened and busy, I settle my jaded self in the pages of this book. Stacey Thacker has understood me. She has heard me, without me saying a word. Fresh Out of Amazing gives me the permission to exhale over the frailties of my life I often try to avoid. I am moved, hopeful, and grateful." "If you have ever felt like you need to be amazing for God, but it is just too big a task, then this book will be so refreshing for you. ... This book was such an encouragement to me to lean into God when I'm struggling with not understanding His plans for my life. It's a beautiful, messy process, but the end goal is growing closer in our relationship with the Lord."